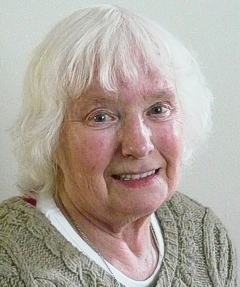 Jan Hastings was born in England in 1933. As a little girl during the years of World War II, Jan kept her baby brother comforted during long hours in air raid shelters by telling him stories. Her vivid - she says sometimes 'mad' - imagination was already in full flow. Jan openly admits that she doesn't know where her flare for story telling comes from - an idea will simply come into her head and she has to put pen to paper immediately. She has never been one to plan a story in advance. Some ideas get discarded quickly, others are developed into short stories or full novels. Jan now lives in Basingstoke in the southern English county of Hampshire. Her latest novel, Kindness to Elaine, is a moving story of a girl surviving tough early years and equally testing later years, her life unconventional but inspiring, coming through it all to bring up two daughters and a son. Inspired in part by the life Jan led as a child, surrounded by poor families, Kindness to Elaine is a story that will live with you long after you have read it.